Salad is always a welcome summer respite. 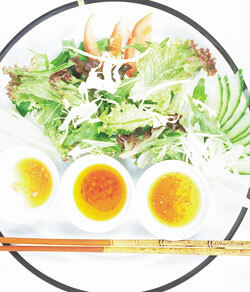 Bring in the tastebud delights from various Asian dressings. 1. Prepare the Asian dressing base. 2. In one shallow bowl mix sesame oil, water, vinegar, garlic and sugar. This is the base for all the dressings. 3. For each Asian flavoring, mix in a desired amount of miso, gochujang or chili pepper. Serve cold.